"Why do we have holes in our burgers?" asked White Castle Vice President Jamie Richardson, rhetorically. "Well, there's the metaphysical answer, which is: They simply do." One might not expect someone from White Castle corporate to get so deep on the chain's burgers (or maybe you would? ), but unfortunately we aren't looking for philosophical takes. White Castle -- beloved fast-food slinger of tiny sliders in sacks, massive cases, and grocery store freezers -- serves up burgers with five mysterious holes in its square meat patties. There's one in each corner and one in the center. And we went straight to the top of the Castle to find out why. "OK, there's also a functional answer, too," Richardson conceded. As it turns out, there are two reasons why the five holes exist. 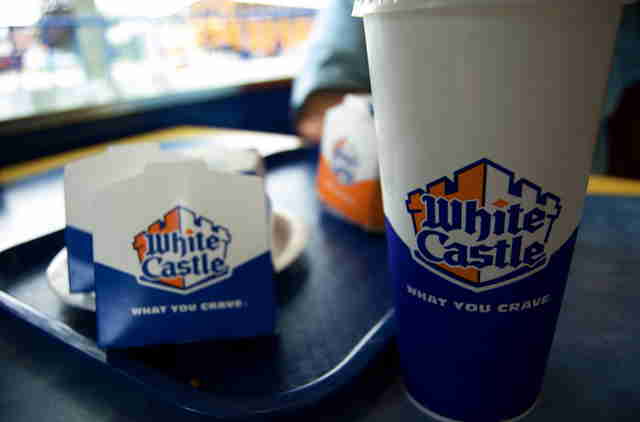 And they essentially helped shape White Castle's distinct taste. Like the Big Mac and the Filet-O-Fish, White Castle’s negative-space innovation came in-house from an employee suggestion. In 1954, a burger flipper working the grill in a Cincinnati White Castle left a note in the store's suggestion box. His name was Earl Howell, and his theory stated that putting holes in White Castle's patties would help them cook faster and help the kitchen keep up with rising demand. "At that time, we were having a major burger boom," Richardson said. "Earl was trying to figure out ways for us to get our burgers out faster because the store was having trouble keeping up with orders. We tested out his theory, and well... he was right." By the end of the year, every White Castle patty in America had five holes in it, and Earl Howell cemented his place in the White Castle Employee Hall of Fame. "No, we actually have a White Castle Hall of Fame, and Earl is in it," Richardson confirmed, just in case we thought he was joking. To understand why this less-than-traditional method works specifically on White Castle burgers (there's a reason every burger doesn't look like Swiss cheese) you have to understand how they cook 'em. White Castle burgers aren't grilled, they're steamed. They stack a pile of onions on the grill, then put 30 patties (exactly the number in a Crave Case!) on top. The steam travels through the onions and cooks the burgers, while the holes in the burgers let the steam get inside and through the patties. This ensures an even cooking surface across the patties and eliminates the need to flip the burgers (remember, they are being steamed). It also means they need to spend less time on the grill -- and they can get out faster. 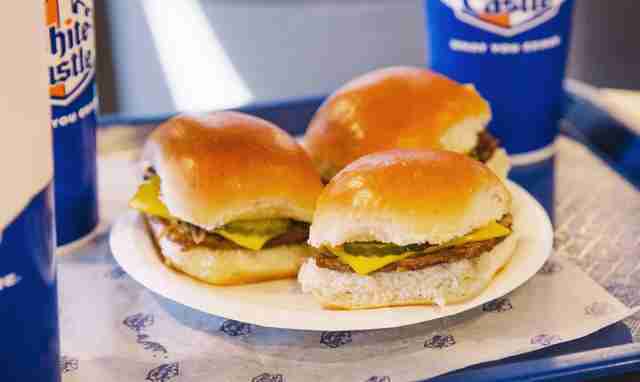 One of the reasons White Castle has such a distinct flavor (you can taste it in your mind right now, can't you?) is because the essence of the onions is contained in the steam that literally cooks the burger. All that flavor mixes together to give the patty one of the more unique profiles in all of fast foodom. "We also realized that not only do these holes make things faster, but they were actually making our hamburger sandwiches taste better, too," Richardson said. "The holes let the patty capture even more of that flavor, and, when we put the bun on top of the patties on the grill for just a second, the steam travels through the onions and the patty and fuses with the bun." That's why everything on a White Castle slider -- even the bun -- has that onion-y, meaty taste. Now you can see why Earl Howell was a first-ballot White Castle Hall of Famer. "I guess you would call that flavor umami," Richard said. "But I just think it's White Castle." Logistically, creating the holes is just part of the initial patty-making process. They even invented a device to help out. "We actually own the patent on the machine that makes the five holes," Richardson said. "It's called a Meat Horn." White Castle starts with a stack of 100% beef ("We call that a beef log," said Richardson) that then goes through the Meat Horn, which puts the holes in the log. 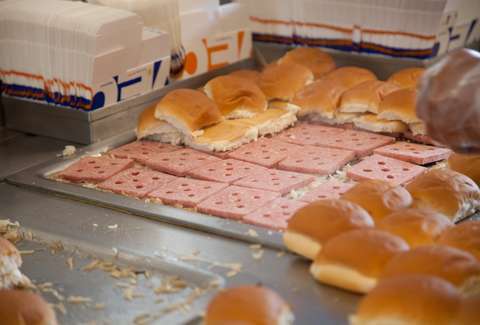 The patties are then sliced and sent out to White Castles across the nation ready to be steamed. So it seems like these holes genuinely helped make White Castle the fast-food behemoth it is today. Are there -- or were there ever -- any plans to tinker with the Meat Horn's design? "You know, we try to listen to our employees and our customers. The stores are always where our best ideas come from. That's where the truth of our business lies," said Richardson. "This is one of those instances where we did that, and it really changed everything. "I don't think we want to mess with this one, it's big part of who we are, and why people love us. I think we'll stick with it. There's a simple elegance to it that just works." The next time your buddy asks you at 3am why White Castle tastes so, so damn good, you can tell him: Meat Horns, holes, and steam -- White Castle's defining trio.